On March 20 – 21, 2015, Eiko Saito Shepherd, Karen Whilden and Diane Tamai Jackson attended the annual EJU kata judging seminar and examination in Ostia, near Rome, Italy. The training seminar was held in the Italian national judo, karate, and wrestling training center, located just two blocks from the sea. The goal of the trip was to better understand how the EJU teaches and examines kata judges according to the IJF kata evaluation criteria. 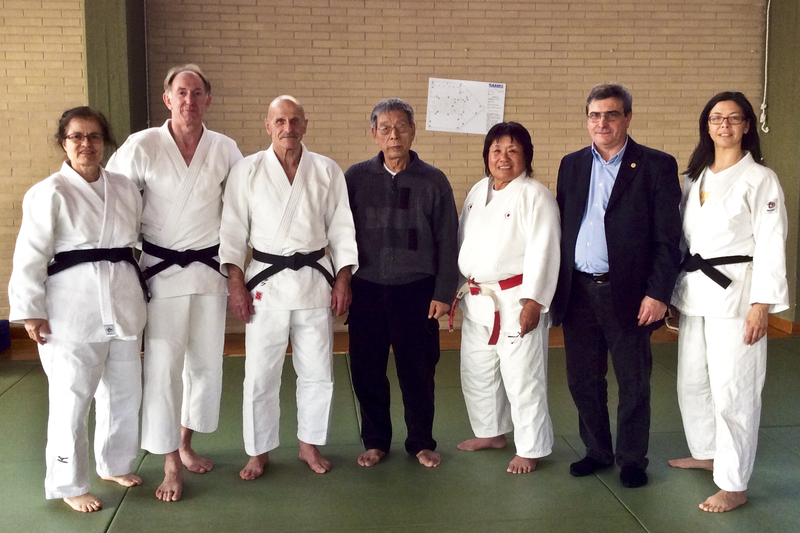 The seminar was conducted by five of the six EJU kata Commissioners. Currently, all European national events (many each year) and European continental events (four per year) are evaluated applying the IJF criteria. Each year at the kata judging seminar and examination, two to three katas are covered. This year, the katas were Nage No Kata, Ju No Kata and Goshin Jitsu. The European participants could test for up to two certifications of the kata offered. The first morning was classroom training. The Commissioners reviewed general criteria of small, medium, and big errors and forgotten techniques, and also particular mistakes for each kata selected for the year. Of particular note, the 2015 changes to the judging evaluation criteria were highlighted. The remainder of the first day was dedicated to teach scoring through demonstration of the techniques and mistakes according to the evaluation criteria. The written and practical examinations were held on the second day. The EJU kata judging test consists of participation in the seminar, a written test, a practical demonstration, and judging under evaluation at an EJU / Continental event. The examination is based on: 1) Knowledge of the rules, attitude and organization and 2) Knowledge of the kata principles. The minimum age for an IJF judge is 30 years old and minimum rank is 4th dan. There is no longer an upper age limit for testing to be a continental or IJF kata judge. Currently, in the USA, there is one active IJF-level kata judge that can judge at the World Judo Kata Championship. In comparison, there are 48 IJF-level judges from European countries. It would be great to have more US or Pan American judges at international events. The IJF kata evaluation criteria was first realized in 2008 and used at the first World Judo Kata Championship, which was held in Malta in 2009. The IJF evaluation criteria has a different base than the US judging framework. Both are based on a maximum of 10 points per technique. However, the IJF criteria have four categories for scoring each technique: Forgotten, Big, Medium and Small mistakes. A Forgotten technique is ‑10 points (or 0 points), plus half of the total score is taken at the end. A Big mistake is an incorrect principle that is worth -5 points; a Medium mistake is -3 points, and Small mistake is described as an imperfection worth -1 point. For each technique, a judge can mark one big mistake, one medium mistake and up to two small mistakes. For example, a big mistake is to perform O-goshi instead of Uki Ogshi in Nage no kata; a medium mistake is to execute a technique in the wrong direction in Goshin Jitsu; and a small mistake is to change pace during a technique in Ju no kata. Additionally, there are many process mistakes defined in the IJF evaluation criteria, such as proper judo gi or incorrect engagement distance to start a technique. Some process mistakes can be applied to both opening and closing ceremony scores, such as improper Judo gi size and improper back number (medium mistakes). To determine the total team’s total kata score, the highest and lowest scores of each technique are discarded and the scores for the remaining three judges are summed; then all of the techniques plus opening and closing ceremony scores are summed. All US kata competitors aspiring to compete in the World Judo Kata Championships should study the IJF evaluation criteria to improve their scores at European and IJF events and watch international competition performances on YouTube. For example, many of the IJF process mistakes are defined as medium mistakes. If a team has the improper engagement position or distance, this will cost the team -9 points (3 judges x -3 points) per technique. Just like in shiai, for the USA competitors to be competitive on the international level, the US will need to evolve its scoring and teaching to better align with the IJF evaluation criteria. Of course, this will take time and education. To learn more, see our full trip report, the 2015 IJF kata evaluation criteria, IJF score sheets and IJF contest rules, which are posted on the Shufujudo.org webpage under Kata.